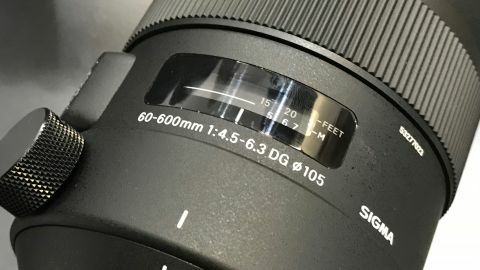 This is perfect super-telephoto superzoom for sports and wildlife fans who just want to carry a single lens. Back to the zoom range. This lens is quite remarkable, with the 60mm ‘wide' focusing down to about 2 feet / 0.6m. At the other end of the spectrum, 600mm is versatile enough on a full-frame camera, but pop it on a APS-C camera and it works out to be 900mm, which is quite a feat and fantastic for wildlife or sports. The lens also lends itself to astrophotography - we tried the lens mounted on a heavy duty Manfrotto tripod, the images of a fairly full moon were quite acceptable even if a little on the soft side – auto iso and about 1/100 sec at max aperture. It would be ideal on a tripod for field events, and probably for general ground or sea based wildlife too; but for birding, unless you're in a hide where you can rest your arms somewhere, it’s a bit tiring if you’re in the open trying to capture birds in flight. Downside is that the collar can’t be removed and the carrying strap is attached to it, it's also a little awkward when stashing in the case as the collar has to be in a particular position before the foam support can be fitted around it. There's no complaints with the optical quality. Fringing is well controlled, and so is distortion, though there's a hint of barrel distortion at 60mm. Otherwise, sharpness and contrast are both very good.